Traditional style pub on the outskirts of Romford town centre situated 5 minutes walk from Romford train station. Buses run frequently in Brentwood Road outside the pub. Russell and Diane Smith welcome you to the Wheatsheaf. We have owned this pub since June 2001. 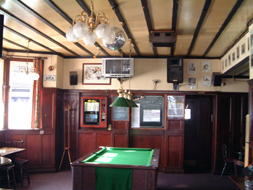 Russell's parents owned the pub from 1969-1993 and many of the original customers still use the pub. We are the only pub in Romford that has two seperate bars. Public bar is the largest bar and has Darts, Pool Table, Fruit Machines, Quiz Machines and Wi-Fi. Popular music is played along with Regular Sports Updates. The saloon bar is a smaller bar also with a TV. Wheatsheaf Golf Society - details of the Socitys calender events etc. We offer a friendly, professional service and welcome new customers along with our many regular customers.